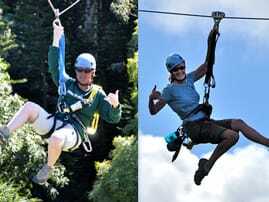 Kauai tours & activities by Just Live Inc.
Just Live! started out with a focus on community programs designed to enrich the lives of each participant, especially focused on those with disabilities. Over time the company expanded to include programs for local youths, young adults and businesses. In its present form, Just Live! now offers the same style of exciting and eco-friendly activities to visitors from all over the world, and they stand by the spirit of their original mission to help individuals grow and develop through new experiences. Juli and Nicole, founders of Just Live!